Most towns had a Letter or Post Office. In larger towns these would include Telegraph and/or Money Order offices. In the rural villages, smaller satellite Post Offices were set up, often running alongside an existing business. Chelveston was no exception and the Post Office has moved location as different businesses took over the role. 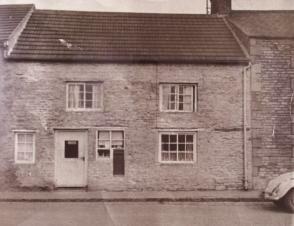 Until 1890, the post was being sent by foot from Higham Ferrers Post Office. There was a letterbox in Chelveston by 1890, which was cleared at 17:20 daily. In 1895, the newly formed Parish Council called upon the Postmaster General to provide a Post and Money Office in the village. In 1896, the Parish Council requested a post box be provided for Caldecott—this request was successful. In Jan 2013, the Caldecott post box was stolen and a new box was located closer to the houses. 1906 Joseph Eady is the first recorded sub-postmaster, running the Chelveston Post Office from his grocer's shop. Letters arrived from Higham Ferrers at 06:50 and 17:00 and letters were sent to Higham Ferrers at 07:20 and 17:15 Mon—Sat. 1936 Mrs Emily Agnes Meadows. Letters are now from Wellingborough Post Office. 1940 Mrs Dorothy Ellen Sharman. 1976 Mr & Mrs Alfred George Leaver. 1977 Mr & Mrs Fredrick Raymond (Ray) Piercy. 1986 Mr & Mrs Michael Pullen. 1987 Mr Trevor Wilkins (Higham Ferrers Post Office). 1987-8 Mrs Joan P O'Grady (formerly Mrs J P Waller). Post Office location until 1976. The Post Office was in a thatched stone cottage in the High St. This building was damaged, when the adjoining cottage's thatch caught fire in 1956. After the fire damage, the thatch roof was replaced with tiles and eventually the front was replaced by a larger window. The shop became the Treasures of Yesteryear (latterly Gracey and Associates, now No.2 High Street). In 1976, Mr and Mrs Lever took over the other village shop (previously the bakery until 1951), at 1-3 Water Lane, and the Post Office part was moved over the road to join them on 10th April 1976. The wall post box (in the image above) was removed and blocked up and a new post box installed on a post outside the shop, which was retitled the "General Stores and Post Office". The Post Office part was closed on 25th March 1987, after which it then ran for 6 months in the air raid shelter part of the Village Hall on Thursday afternoons only (as a satellite of Higham Ferrers North End Post Office) until 12th November 1987. Then for a few months it ran from a kiosk on the garage forecourt (now JST Forklifts), but closed soon after. The Royal Mail offered rate in 1988 was £999 pa for 6 hours (two mornings) per week.